The Australian Water Partnership (AWP) has recognised river basin planning in India as an emerging and key priority for its investments and has sought to support this through the development of appropriate modelling tools, decision-support systems, and policy / institutional frameworks to promote river basin planning and management. 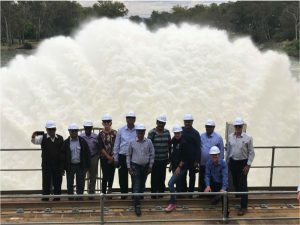 In support of river basin planning in India, and aligned to the National Hydrology Project, the AWP and World Bank supported eight senior water management professionals to undertake a technical visit to Australia from 19-23 November 2018. The delegation included the Secretary of the Water Resources Department in Karnataka, Mr K Jaiprakash, as well as representatives from four Indian states which form part of the Krishna River Basin (Andhra Pradesh, Karnataka, Telangana and Maharashtra). Delegates were offered a wide range of presentations and discussions related to the history and governance arrangements of the Murray-Darling Basin (MDB), water sharing and allocation, stakeholder engagement, modelling and modelling tools, water trading, compliance, dam safety and salinity management. Over the week, more than 25 experts from Australia presented to the delegation, including from key institutions such as the Murray-Darling Basin Authority, Department of Agriculture and Water Resources, the Department of Foreign Affairs and Trade the Commonwealth Scientific and Industrial Research Organisation (CSIRO), state government water agencies and irrigation corporations. Representatives from the four Indian states also presented their perspectives, and the key water management issues facing their jurisdictions including the Krishna River Basin as a whole. Delegates visiting irrigators in Shepparton, Victoria. The delegates and the AWP River Basin Planning (RBP) Team had exposure to each of the Indian States’ capabilities in irrigation, water supply, and groundwater management through their videos and presentations. Representatives discussed the progress of National Hydrology Project III, including future developments. A highlight of the week was the delegation meeting a farmer from the Cooma district near Tatura, to discuss irrigation technologies and water management strategies. The delegates were interested with the farmer’s capability to cultivate 3000 acres land with just his son and no additional labour, who showed the application of water ordering through mobile phone to Goulburn Murray Water corporation. Later, at Goulburn Murray Water office, the delegation experienced the working of the supervisory control and data acquisition (SCADA) system for water supply, storage, and trading. 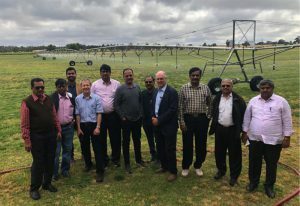 Delegates visiting irrigation equipment in Shepparton, Victoria. The Indian delegation demonstrated a keen interest in the history and governance of the MDB, in particular how states have come to agree on the MDB Plan and put in place water sharing arrangements. Presentations from former NSW Water Commissioner David Harriss, as well as former Chair of the National Water Commission Karlene Maywald, and Phil Heaphy from Victoria’s Department of Environment, Land, Water and Planning provided insights into the political context. They also explained the incentives that were put in place to drive reform and build a governance context which enabled the elements of the MDB Plan to come together and be agreed upon by the four states. The role of the community (stakeholders) in driving change and enabling the MDB Plan to be developed and agreed upon was highlighted by a range of speakers, who also stated that while community pressure drives politicians, good institutions and sound science are also essential for river basin planning. While water trading is not appropriate in contexts that do not have a range of governance mechanisms in place necessary for transparently managing a market-based system, it has served Australia well in terms of providing certainty to farmers, allowing for inter-basin transfers, and driving efficiency. 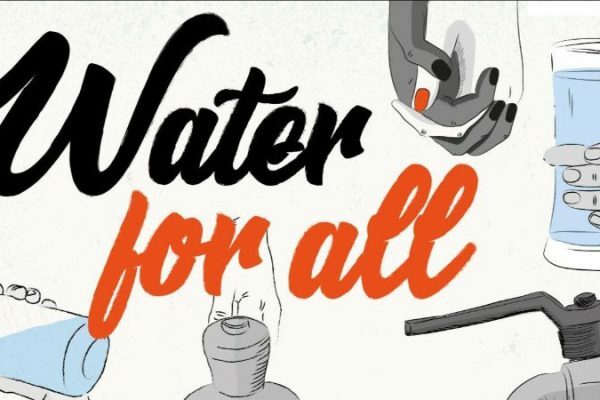 Speakers offered that the planning, regulatory and market-based system in Australia aims to establish an optimal balance between administrative and individual decision-making in order to maximise value from scarce water resources. Other benefits discussed during the week included irrigators enjoying improved risk management processes, and all water users receiving a clear signal about the value of water. Discussions were also held about the difference in agricultural context between India and Australia, with India having many poor farmers with small parcels of land to farm and many farmers working on land that they do not own, in comparison to Australia which has highly mechanised farming on large farms. Despite the obvious differences, water management concepts, technologies and processes were discussed and shared between delegates and Australian presenters and hosts. Delegates on the Hume Dam on the Murray River. Delegates were taken to see key water infrastructure along the Murray-Darling including Hume Dam, where dam safety processes and institutions were discussed with Water NSW. At the end of the week, delegates were asked what questions they still had and how these could help inform the next stage of collaboration between Australia and the Krishna River Basin states for the next phase of the project. The RBP team will return to India in early 2019 to resume collaboration and knowledge sharing between India and Australia on river basin planning issues. 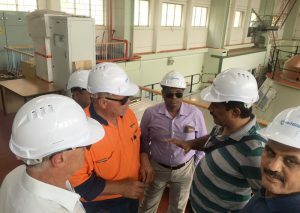 The technical visit was organised and facilitated by the RBP team comprising David Winfield, Advait Madav, and Tony Weber from Alluvium; David Harriss from Access Water Management; and Melita Grant from the Institute for Sustainable Futures, University of Technology Sydney. Contributions were also made by Will Fargher, Stuart Richardson, Perin Davey, ICE WaRM, Geoscience Australia, CSIRO, the Bureau of Meteorology and state agencies from Victoria, NSW and South Australia. Indian delegates included representatives from the Water Resources Department (Andhra Pradesh, Karnataka and Maharashtra), Ground Water Department (Andhra Pradesh and Telangana), Irrigation and CAD Department (Telangana) and the Maharashtra Engineering Research Institute.